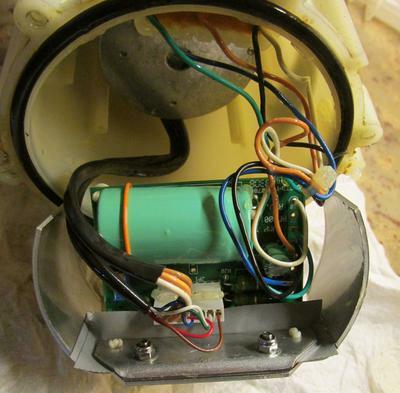 In a related post (Aquabot Bravo – Pandora Smart) I promised to post details of the repair of the suction pump on my Aquabot Viva. The part number of the pump is AS06080SP and I have gobbled up 3 pumps so far – an expensive situation at $300 a throw! Fortunately, I saved the 2nd and 3rd of the faulty pumps so always had a reference to look at. Hopefully the photographs will overcome this requirement….. 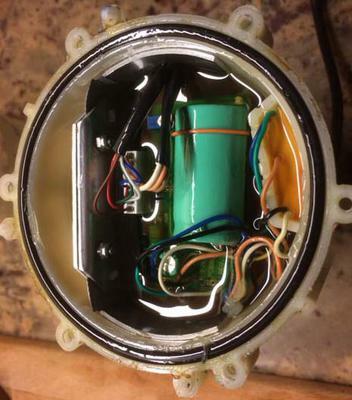 Note that this repair involves some tricky procedures if you are not handy with a soldering iron and the use of a meter capable of measuring resistance. I would recommend you talk to friends with some electronics experience if “starting from scratch”. Opening the pump is quite easy. I did it over a large plastic bowl to catch as much oil as possible. When I drained my pump and left it to settle for a while I noticed a small amount of water sitting under the oil so obviously there had been a small leak before the failure (I am not sure if this was the cause but more on this later). As you will see from photograph “Fig 1”, the electronics board is located on an aluminium structure that push-fits in the top of the plastic case. “Fig 2” shows the aluminium mounting structure partially pulled out. As taking the structure out with all the cables attached is quite difficult, and I wanted to work on the electronics on my workbench, I cut all the five small wires that lead back to the incoming plug at the halfway point (these are the five individual wires that are white, black, yellow, green and orange). Once these are cut the whole structure can be pulled gently out of the plastic case. 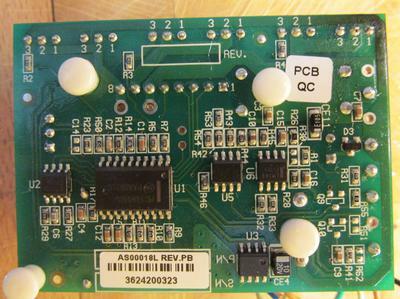 At this point the electronics structure is only connected to the pump by two black cables that connect to the electronics PCB via a small while plug (refer to Fig 2 where it can be seen). This can be disconnected by gently “wiggling” the plug from side to side while pulling on the cables. REMEMBER which way round it goes for re-assembly! You now have the whole structure free to work on. You will see that the aluminium mounting (which also acts as a heat-sink for the transistors we are now going to expose) has two nut/screws that clamps its two pieces together and also two white plastic pins immediately adjacent to the nuts/screws. Firstly, remove the white pins. They are in two pieces and are removed by gently pushing the central part out using a very small screwdriver. The central part acts as a “spreader” that locates the pins in the aluminium leat-sink. Once the white pins are removed you can undo the screws and nuts and remove the aluminium heatsink from the transistors. Remember (or take a photo) how the insulating tape fits between the aluminium heat-sink and the transistors. THIS IS CRUCIAL to insulate the transistors from the aluminium and MUST be put back correctly. pump the left-hand pair had failed. Both showed a resistance of less than 5 Ohms. “Fig 4” shows the reverse side of the PCB and clearly shows the solder points of the transistors (all marked 1,2,3 for each transistor). This is where I measured the transistor resistance between pins. For reference the FET Transistors are IRFZ44V and IRF5305 which can be obtained easily (mine were purchased on Ebay for around $1.50 each plus delivery). Getting the failed transistors off the board is not easy and should be approached with care to ensure that you do not damage the very small tracks on the board. I tied a piece of thread through the mounting hole on the transistor and then gently pulled while heating the pins with a soldering iron. Alternatively, you can cut the pins and then remove each pin individually. Once the transistor is removed you need to clear out the solder from the mounting holes. I did this with a heated pin and then a small drill the same size as the transistor legs. Once this is done you can solder in replacement transistors. This needs to be done with a soldering iron with a small bit to ensure that each leg is heated individually and solder does not migrate between the pins. Make sure that the height of the new transistors is the same as the existing ones and that they do not touch. Once this is done you can re-assemble the aluminium heat sink to the transistors remembering to insert the tape insulation between the heat sink and the transistors. Then gently push on the white cable connector with the two black cables from the motor. Make sure that it is aligned properly, is the correct way around and covers all the pins. I marked the connector saying “towards FET” on the relevant side. The whole assembly can now be pushed back into the plastic pump housing. You will now just have the five coloured wires to re-connect. I did this by soldering them together and covering with heat-shrink. Fortunately, as they are all different colours it is difficult to make a mistake! 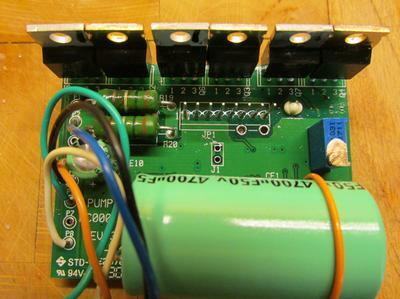 Before going any further I then tested the whole pump by connecting to the Aquabot Viva. I only ran the pump for a couple of seconds as there is no fluid at this point to dissipate the heat from the transistors and they run VERY hot. They will destroy them themselves if run for very long with no fluid! As all seemed fine I then filled the pump with oil. I used synthetic motor quality oil as I did not want to use contaminated old oil – in my case Castrol Edge 5W-30 (expensive but I had some spare from an oil change). I did NOT fill the pump to the top due to the fact that heated air can be compressed but fluid (the oil)cannot and I did not want oil being forced past the seal when the pump and transistors heated up. I left approximately 5mm of air at the top of the pump. It is also worth noting that as I had seen water ingress in both my failed pumps, I tried to reduce the chance of a leak by taking out the sealing ring and liberally coating the seal and recess with “gasket seal” making sure that none went on the inside of the assembly. I used Loctite 5980. One of the repaired pumps has now been in operation for a few days without any issues so this seems to be a successful project. I hope this all makes sense and helps others. Feel free to comment or request further information. However, It DOES raise the question, if I can repair this motor within 2 hours at a material cost of less than $5 why don’t Aqua Products provide the same service rather than just offering a replacement pump at $300+?